Subscribe to our Mailing List to receive news and updates about Gainers Creek Crafts including new products, promotions and upcoming events. 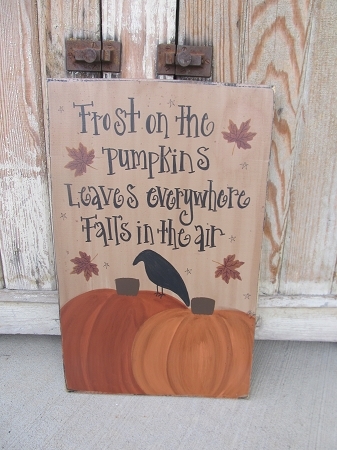 Primitive Hand Painted Frost on the Pumpkins Autumn Fall Wooden Sign. Hand painted and primitive perfection for fall. The saying is Frost on the Pumpkins...Leaves Everywhere, Fall's in the air. The bottom has two hand painted pumpkins in two shades of orange that have been antiqued along with a crow. Design choice to have crow painted on or removed. Falling leaves and a few tiny stars in the background complete the sign. Shown with a sawtooth hanger but a wire hanger can also be used. Size is 18"x 12", pine board. Hand painted and signed by Heidi. Made just for you when you order. Gainers Creek Crafts © 2012-. All Rights Reserved. Design by Flying Orange.